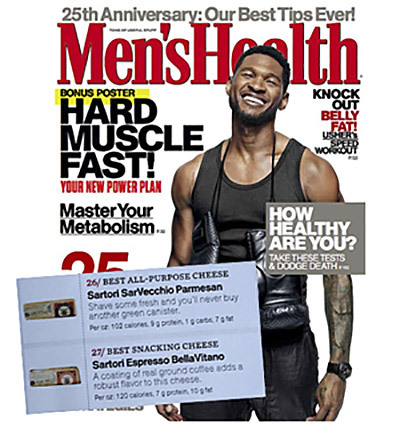 Plymouth, Wisconsin (October 15th, 2013) – Sartori Cheese is excited to announce their inclusion in Men's Health Magazine's 125 Best Foods Feature. Sartori's SarVecchio® Parmesan was named "Best All-Purpose Cheese," while Sartori's Espresso BellaVitano® received "Best Snacking Cheese." Each year, Men's Health Magazine publishes their 125 Best Foods List that focuses on low calorie, high protein and rich in fiber foods. Sartori's SarVecchio Parmesan, "Best All-Purpose Cheese," contains only 100 calories and has more protein than red meat per ounce. Even those with lactose intolerance can enjoy this cheese due to its extra-aging of at least 20 months, making it a near-lactose free cheese. Not only does SarVecchio Parmesan provide exceptional health benefits, but it has multiple uses as a table cheese and it can be grated or shredded on salads, pastas, pizzas, burgers and many other dishes. "Best Snacking Cheese," Espresso BellaVitano is one of Sartori's most innovative cheeses. In 2012 at the Dairy Innovation Awards, Espresso BellaVitano received top honors as the competition's Best Cheese. Espresso BellaVitano is hand rubbed with freshly ground espresso beans, giving it a slightly smoky, roasted flavor. Pairing Espresso BellaVitano cheese with dark chocolate and nuts is the perfect snack providing calcium, protein and fiber. "We're thrilled to be included in Men's Health Magazine as their cheese selections. Our SarVecchio Parmesan is such an incredible, versatile cheese and our Espresso BellaVitano has quickly become a fan-favorite since its debut in 2011. We are very thankful for the support of Men's Health Magazine to recognize our cheese as their top choices for men in 2013," stated Chad Vincent, Sartori's Chief Marketing Officer. For additional information on SarVecchio Parmesan, Espresso BellaVitano and all of Sartori's cheeses, visit their website, sartoricheese.com. For daily news and information, become a fan on Facebook and follow Sartori on Twitter @Sartori_Cheese. Sartori has been producing artisan and premium cheese for seven decades for Specialty, Retail, Ingredient, Restaurant and Food Service markets. Based in Plymouth, Wisconsin, Sartori has an impressive array of award winning cheese noted for innovative approaches and consistent top quality across their entire line. For more information, please visit www.sartoricheese.com or call us directly at 800-558-5888.